Diving into Albania was an adventure unlike anything I’d ever imagined. Few places in the world can lay claim to vast unexplored water off its coastline. Maybe it’s the murkier than average water or the country’s troubled history. 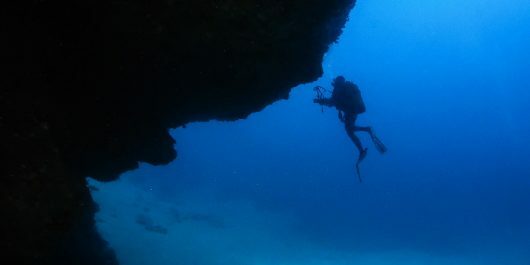 Whatever the case, Albania’s Ionian sea can make an underwater explorer out of any seasoned diver. The 28,748 square kilometre country of Albania is located in the Balkan region of Europe – just above Greece and right under Montenegro. 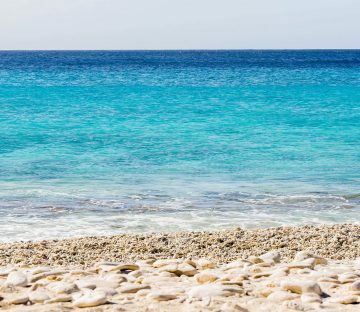 Made up of mostly mountainous terrain dipping down to blue Mediterranean waters, Albania’s unique nature and picture perfect landscapes are slowly transforming it into a highly sought out tourist destination. On the whole, Albania itself is a pretty underdeveloped place when compared to the wealthier western region of Europe. Thanks to the bout of communism strain that lasted up until 1991, Albania is a country that is still trying to rebuild from the dark years of civil unrest. 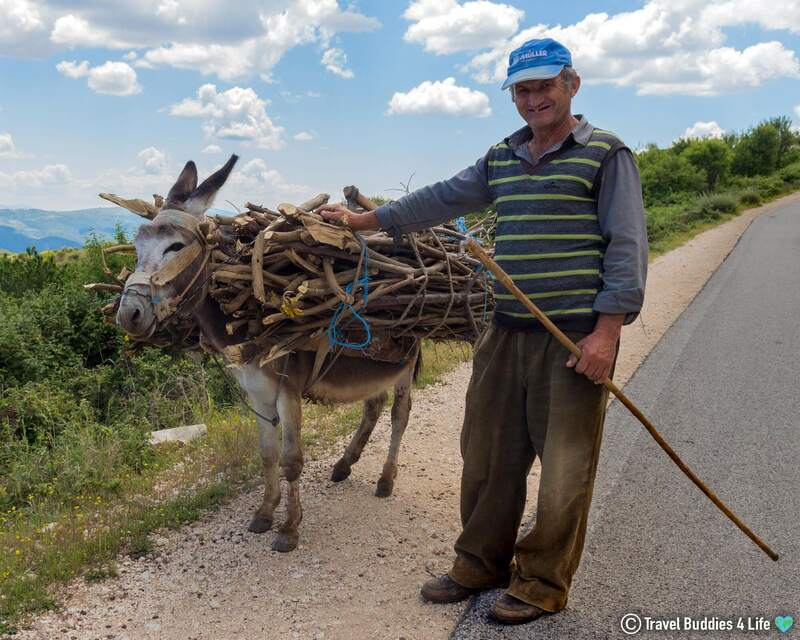 What does underdeveloped Albania mean for tourists? If you are traveling to Albania, don’t expect flawless high-end hotels like you would find in Portugal or Austria. 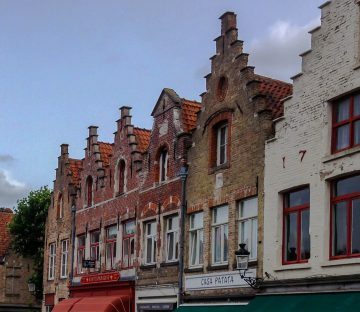 The country has tonnes of old abandoned buildings and roads which are less than ideal. On top of the rundown infrastructure, tap water is not considered safe, therefore drinking bottled water is an absolute must. But if you can look past the bumpy old roads and rickety buildings, Albania has a cost of living that is cheap as chips, and there is a forbidden beauty that hangs in the flowery mountains of this up-and-coming travel destination. 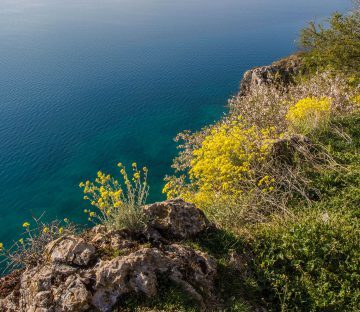 Given the strong push for travel geared rebuilding in the country of Albania, lots of money and resources have been dedicated to raising the quality of life above the water. Because of the focus on terrestrial development, less critical commodities such as exploring the underwater coastline has taken a back seat. To this day the government is still attempting to charter the Ionian sea off Albania, mapping out new and undiscovered treasures on the seabed. 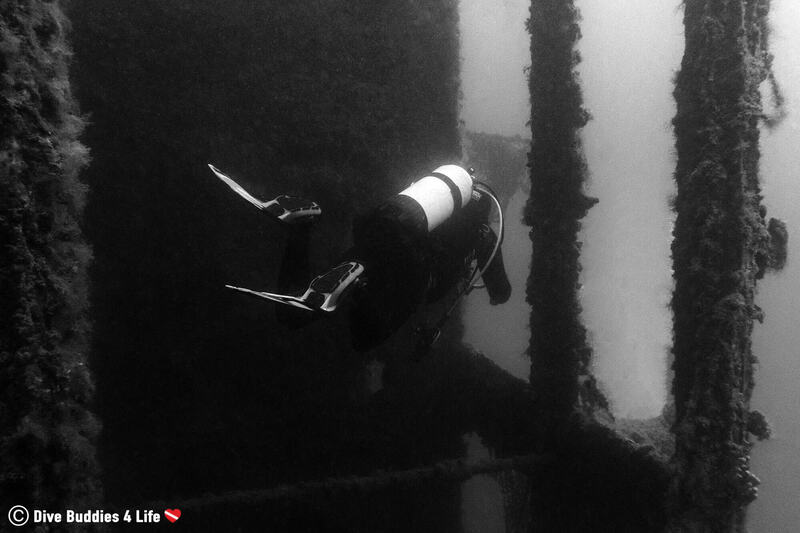 Wrecks, planes, mines, your guess is as good as mine as to what is still beneath the waves. Considering Albania’s colorful history and the regions recent violent past, Joey and I were sure to find a couple of compelling dive sites in the Ionian sea. 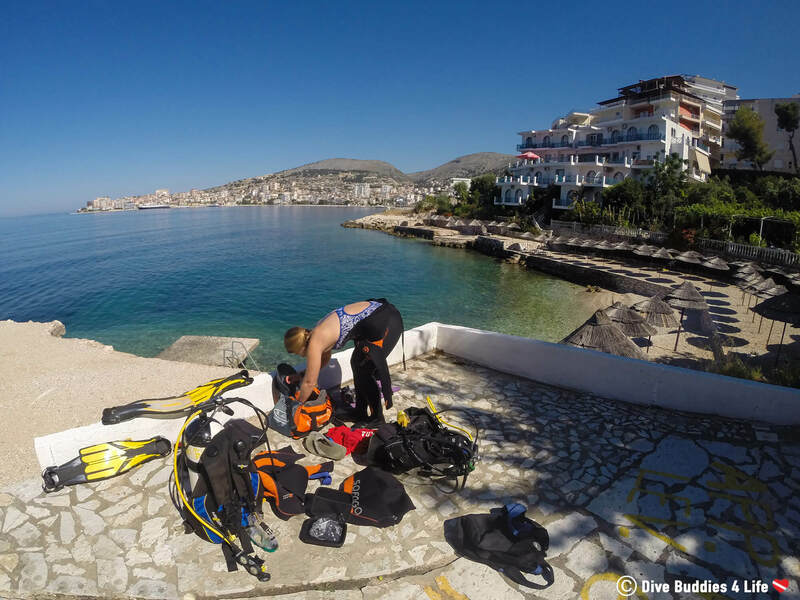 Practically as soon as we arrived in Sarandë, we found one of the only dive shops in this resort city. I’m not going to beat around the bush when I say that Spiranca Dive Centre was a small shop very much in it’s building phases. But for being a rarity in a very touristic city, the place had everything we could possibly need for a couple of recreational level dives. The Spiranca owner and his wife spoke broken English, and through tricky communication, we eventually arranged all our scuba plans. 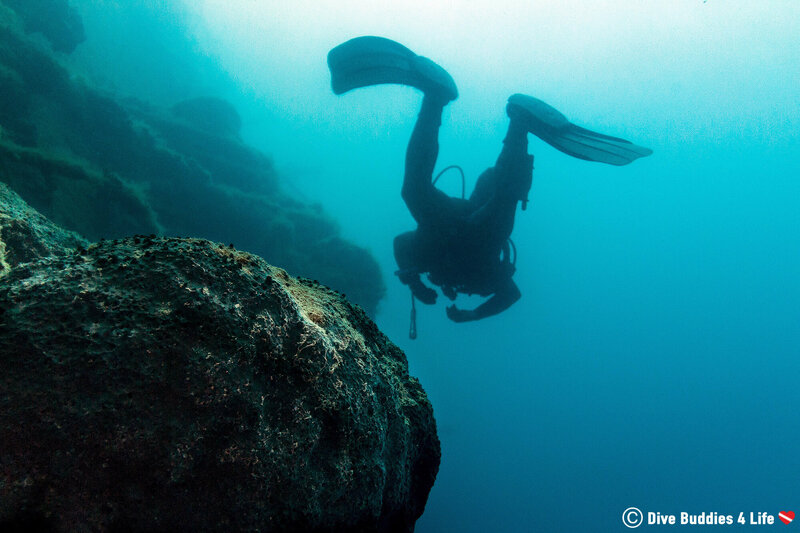 Of the many undiscovered shipwrecks that you can be sure are found off Albania’s coast, Sarandë has two well-known dive sites located a comfortable surface swim from shore. 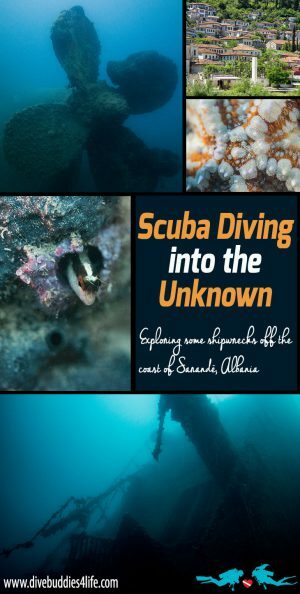 Because of the close location and ease of accessibility, it was decided that we would spend our two dive days investigating these sunken wonders. Nothing says welcome to Albania more than exploring an ancient wartime shipwreck on our very first dive. Along the sandy bottom of the Bay of Sarandë, less than 300 meters (984 feet) from the shore, lies the remains of an old World War II Italian cargo ship. The boat is marked with a surface buoy keeping boat traffic away from the dive site and also enabling divers to take a compass reading before heading underwater. The SS Probitas is roughly 115 meters (377 feet) in length and rests on its port side along the seabed. 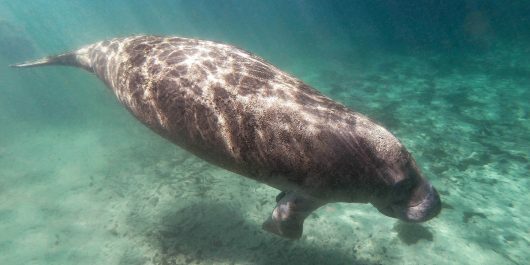 At its shallowest point, the vessel is in a mere 3 meters (10 feet) of water tapering down to a maximum depth of 18 meters (59 feet). As we prepared our dive gear at the surface, I looked out onto the Bay of Sarandë in pretentious apprehension. The day had finally arrived where Joey and I would dive our first World War shipwreck. Once ready for submersion I waded into the Ionian sea. Quickly I felt a jolt through my body as the cold water seeped into my wetsuit. In spite of the hot and arid weather we had been having in Albania, the sea was still uncomfortably cold. We wasted little time at the surface before dunking down into the silty water of the bay. Following our divemaster, Joey and I finned through the warm upper layer of the water column, which carried a substantial residue of sand and mud from the previous days of rain. Because of the turbidity and low visibility, we made sure to stick close to one another’s heels. When we hit the 3-meter (10 foot) mark and had distanced ourselves enough from the shoreline, some of the turbidity cleared, not too extraordinary levels, but enough that we could see into the distance ahead of us. The mud and sand on the bottom seemed to spill for miles. Poking around the mucky bottom I spotted the occasional crab and fish hurrying along the benthos, but on the whole, Sarandë appeared to be a pretty lifeless area. 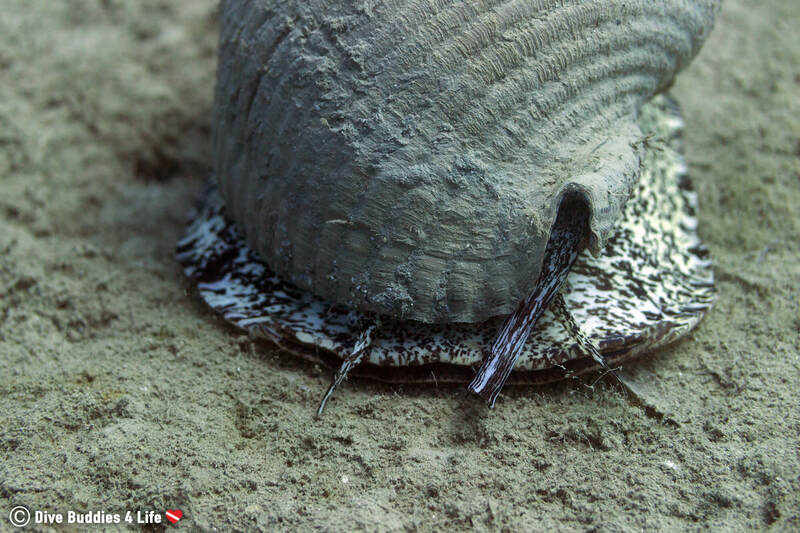 One of our most note-worthy finds in the mucky expanse leading up to the shipwreck was a big beastly marine snail. I’ve seen underwater snails before but none that could match this guys size. The spiral shell alone was roughly as big as a cantaloupe. The snail’s skin was white mottled with black splotches making me think of a jersey cow. Moooooooooo! Staying at a relatively shallow depth, we left the mud and snail behind swimming until the dark silhouette of a ship came into view. From the divemasters description, I knew the boat was going to be big, but I had not quite fathomed how enormous it would be until we swam up to its humungous hull. My mind was blown away by all 115 meters (377 feet) of this bad boy! Given the monstrosity of the boat and the depth at which it rested the dive was a rushed one. There was so much ground to cover to see every inch of the SS Probitas and limited bottom time. It’s not my favorite thing to do, but I was regularly taking pictures on the fly. Interesting Fact: It is hypothesized that the SS Probitas cargo ship was sunk by a German Bomber returning to its home country after an attack on the Balkans back in 1944. As proof, if you inspect the side of the ships while diving, you are still able to see what is thought to be traces of the bombs. For scuba divers with more time to spare, ideally, a ship like this would be done in two to three separate dives. After our single dive on the Probitas, I would highly recommend it. 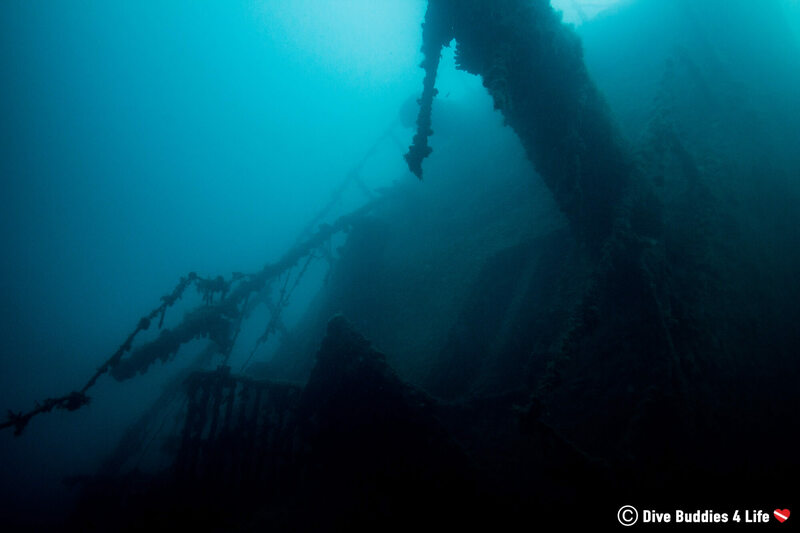 More time would give divers a chance to see and enjoy the different sections of this large cargo vessel. 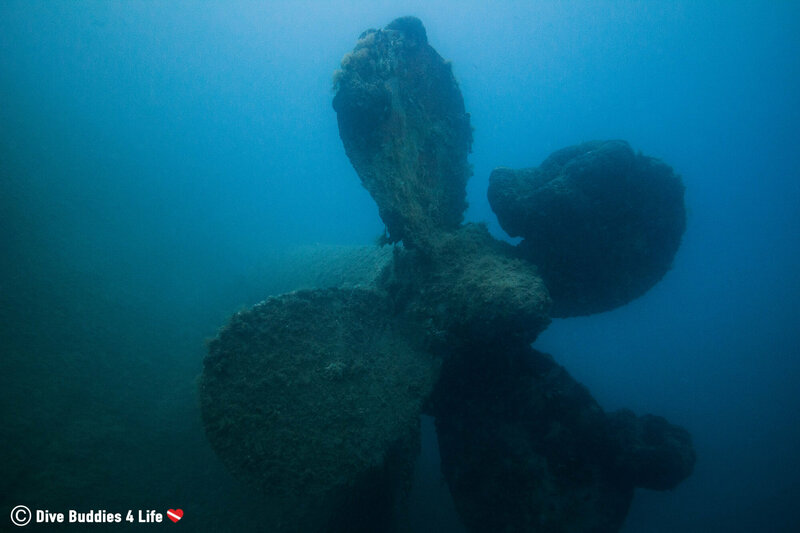 We ended the dive at one of the ships most photo-worthy spots – the ships still perfectly intact propeller. 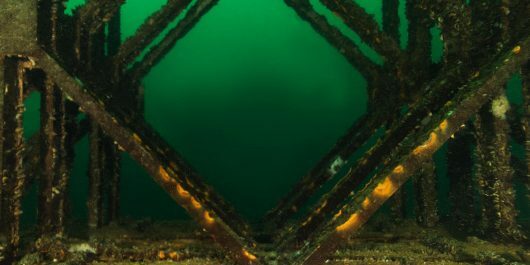 The metal blades had sponges and algal growth aplenty on the corroded surface. As we left the SS Probitas shipwreck behind and puttered towards the shallows, we happened upon an unfortunate trash hotspot. 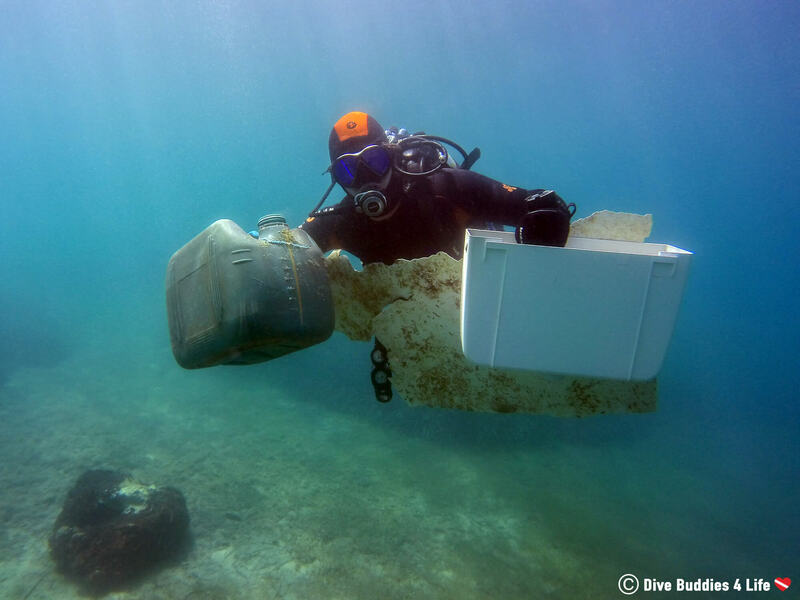 Our dive guide began gathering the discarded garbage that had been carelessly dumped into the bay without a second thought. Following his lead we started doing the same; a plastic lawn chair here, and a rusty tin can there. Before we knew it, our petty trash collecting turned into a mini Bay of Sarandë cleanup, each of us grabbing as much trash as our hands and fins could carry. Good karma is always a good way to end a dive! Dive number two was to the Peshkatarit, a fishing cutter now shipwreck, at the bottom of Sarandë thanks to a collision with a ferry boat back in the 70’s. In our pre-dive briefing, we learned that the Peshkatarit fishing vessel was 60 meters (196 feet) long and draped with curtains of hanging nets and colorful markers. The boat sits in 30 meters (98 feet) of water with a rear mast that rises from the bottom to a shallow 23 meters (75 meters). The main word of caution from our divemaster was to watch out for the excessive nets and ropes, found on the vessel, to avoid getting entangled. 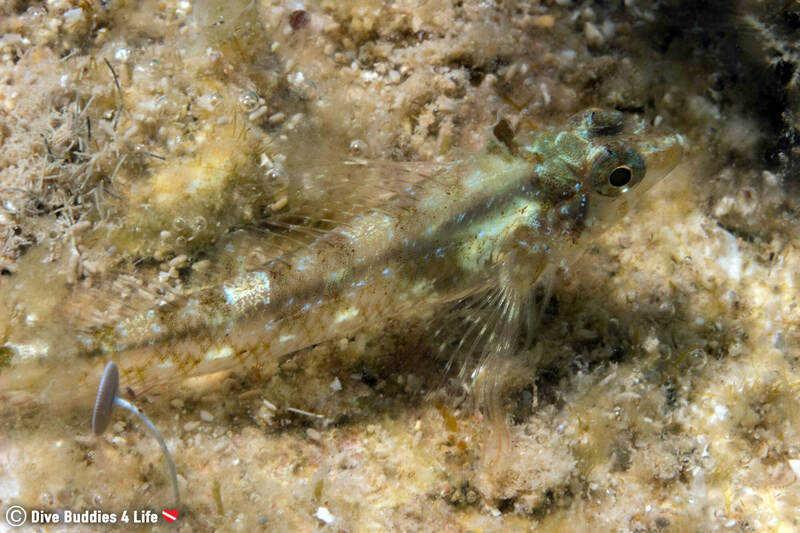 Based on our previous day’s dive and the sparse amount of sea life found on the SS Probitas, I was curious about what to expect of the Peshkatarit. Much like the Probitas, our dive started with a short, but sweet surface swim to the fishing vessels final resting place. Together with Joey and the divemaster, we slowly ascended to the stern of the ship in a cascade of silver bubbles. As we dropped past 3 meters (10 feet), again, the turbid visibility dramatically improved. The more we descended, the better the clarity seemed to get in terms of distance. As the sunlight slowly diminished at 15 meters (49 feet), the murky and shapeless shadow of an old fishing boat took form. 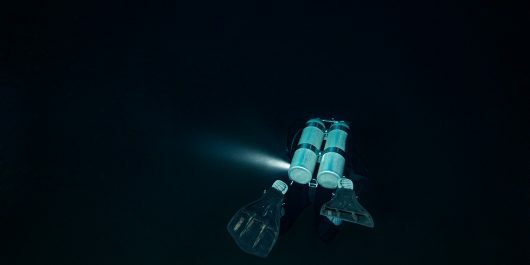 My first thoughts with regards to this dive site revolved around how cruddy visibility was – yet again. As bad as the visibility was, it did somewhat set the mood for this eerie ghost ship strangled in fishing nets. I couldn’t help but get the creepy crawlies as the bow of the vessel drifted into view in these strange and unknown waters. We leveled off our dive at 26 meters (85 feet). Swimming from the bow towards the stern, we passed curtains of hanging nets. 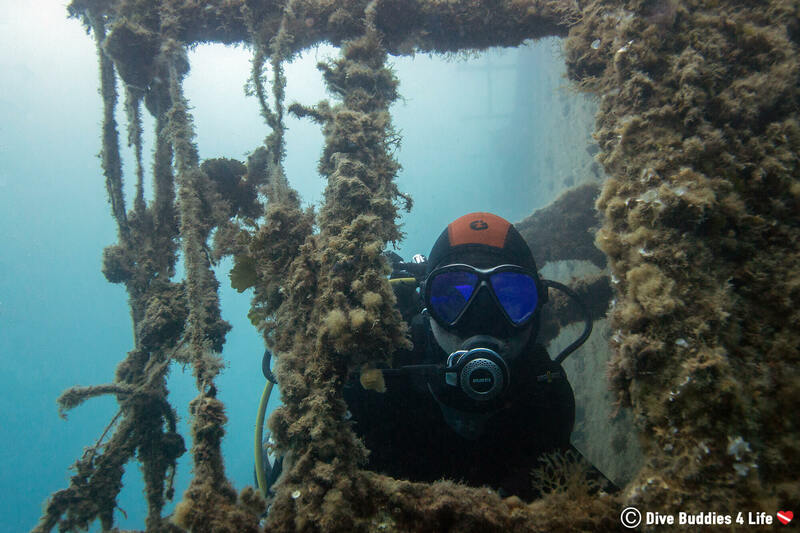 The overgrown nets made the wreck look so alive as it provided places for plant and sponge life to flourish and grow. Being careful not to brush up against them Joey and I continued to play follow the leader with the divemaster as we searched out macro critters. Overall, the Peshkatarit was decent size wreck intent on putting on a show. On this dive, the marine creatures were significantly more bountiful, and the algal growth displayed much more color. We saw gobies, sea stars, scorpionfish, nudibranchs, sea bream, sea cucumbers, sea snails, and that’s only naming a few. Joey and I appreciated that knowing our experience level, the dive guide hung back and let us do our own thing. 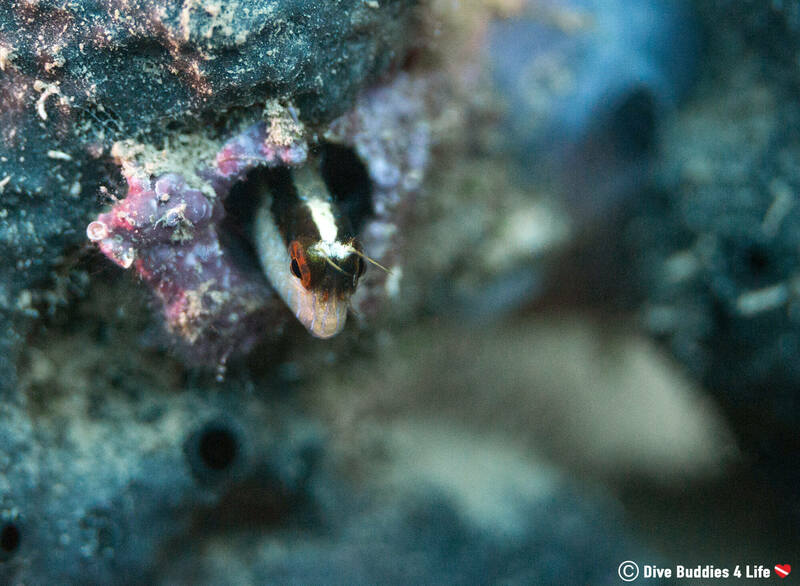 I loved watching the gobies and scorpionfish scurrying along the ship’s hull and poking out of every little hole they could manage to find. I was also mesmerized by the pulsing movements of the centipede-like fireworms that seemed to be everywhere on this strip of coastline. 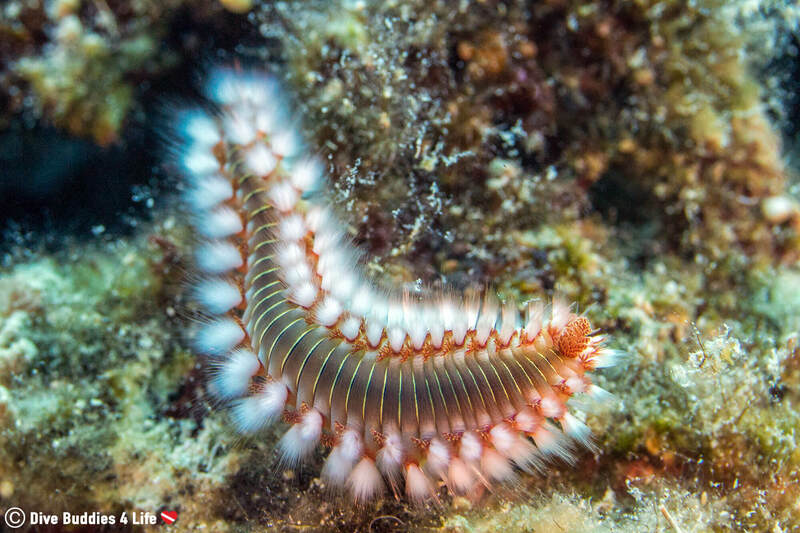 Interesting Fact: While not considered dangerous or a threat to humans, fireworms do have bristles that, when flared can penetrate the skin causing stinging, irritation and a burning sensation in the area of contact. 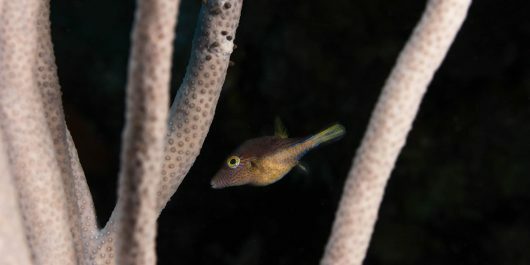 I can never get enough of fishy animals, but eventually, we decided to call it a dive and head back to shore. 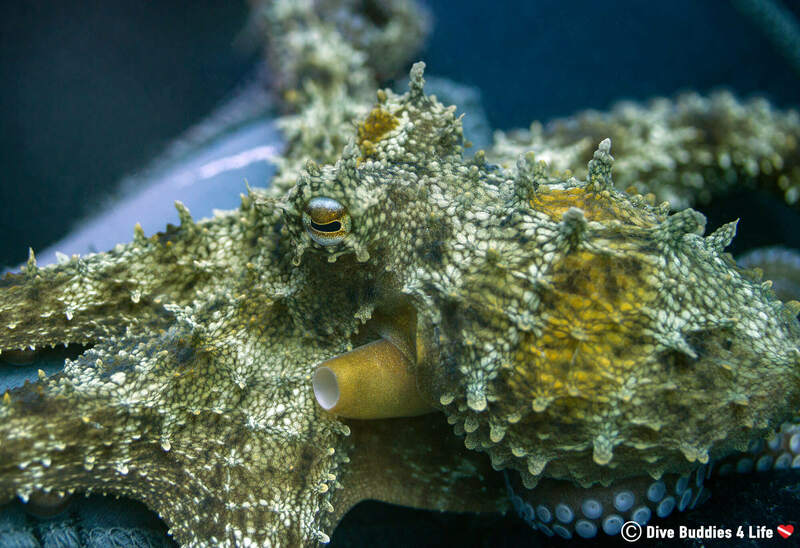 We did our 15-foot safety stop but not before running into a curious octopus and two flying fish, a first for us. What a lucky day! I ended the dive giddy with excitement. Europe isn’t known for diving compared to the rest of the world, and if you are going to dive on this continent, Albania certainly isn’t the go-to diving mecca. If you’re a prospective diver thinking of dipping into Albanian waters, your first challenge will be finding a reputable dive shop. 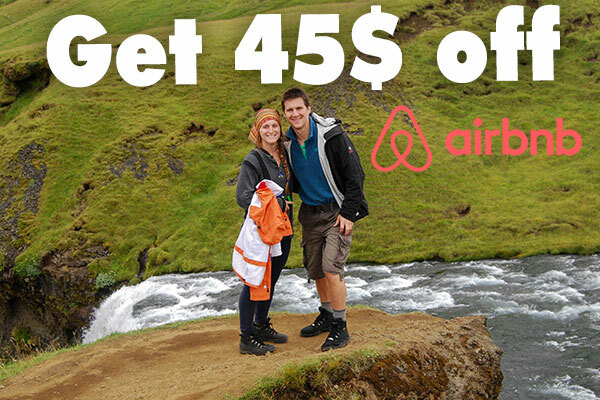 Once you’ve taken care of that, be prepared for days of poor visibility, cold water, and unexpected encounters. 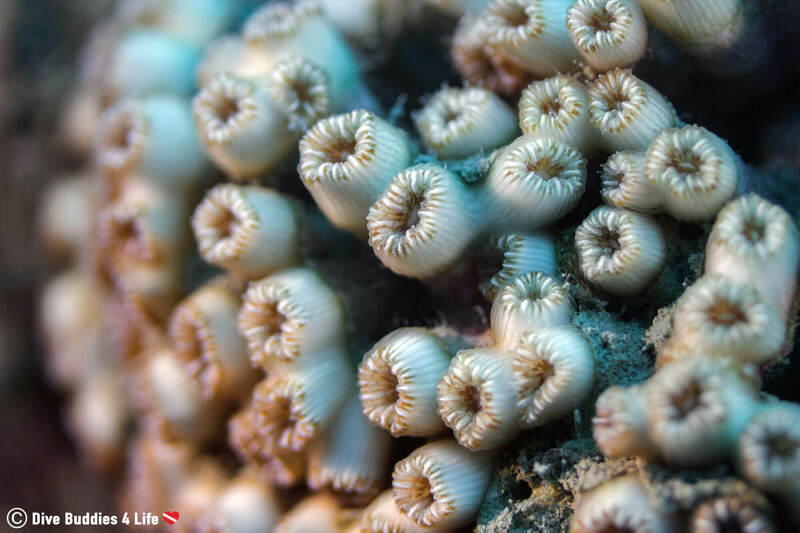 You could have dives where you have little to no fish sightings, and you could have days where you hit the diving jackpot. But then again sometimes that’s the fun of diving – never knowing what you will cross paths with. 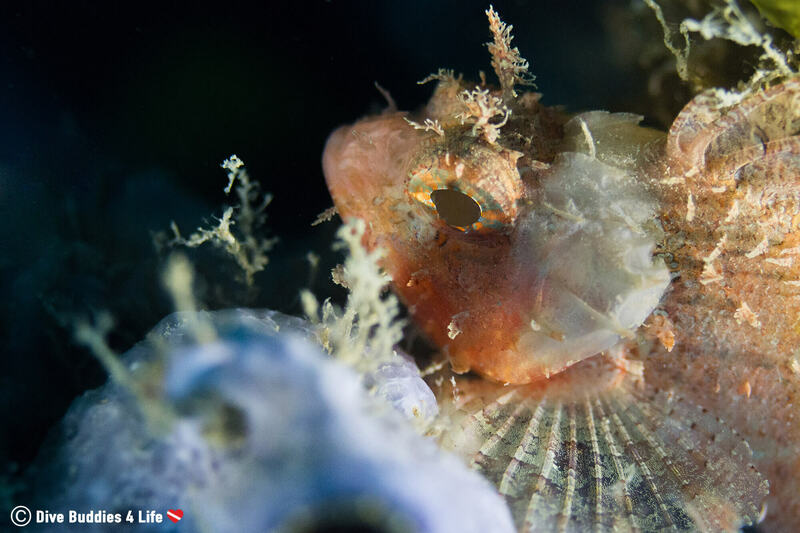 All in all, scuba diving in Albania may not be everyone’s cup of tea, but for a couple of adventurers at heart, it’s kind of neat to know that there is still so much unknown just waiting to be found on the seabed! 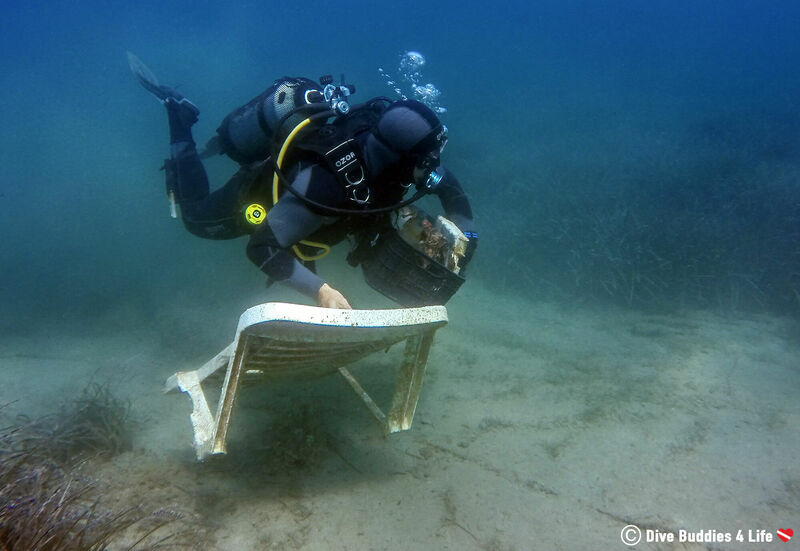 Cost: The price for scuba diving in Sarandë, Albania can be variable depending on the time of year. Overall budget around 40.00€ per shore dive with equipment, however, don’t hesitate to speak with the dive shop and try to bargain yourself a deal if you plan on doing multiple dives. Seasonality: As with any dive location, if you have your heart set on diving, you can take a swim in this location all year round, however, it shouldn’t come as any surprise that the best times to dive in Albania are in the summer months. 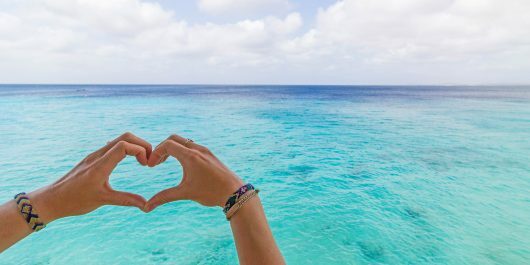 For optimal diving, plan your trip to Albania between May to October when the temperature is high, and the chances of rain are low (with July, August, September, and October being the warmest). Restrictions: When it comes to diving in Albania, there is not too much red tape to maneuver around. The diving regulations are pretty lax to the point that Joey and I didn’t even need to show our dive certification to rent equipment and take the plunge. 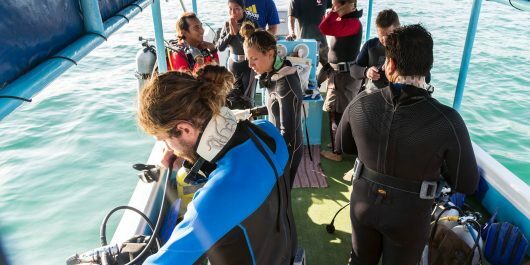 Because of this lower standard of scuba diving, anyone planning to explore this region should make sure they are competent and self-sufficient divers. 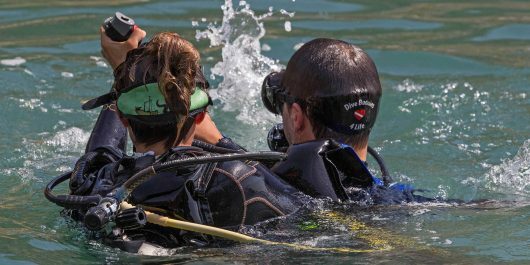 Companies: Scuba diving in Albania is still an up and coming sport. 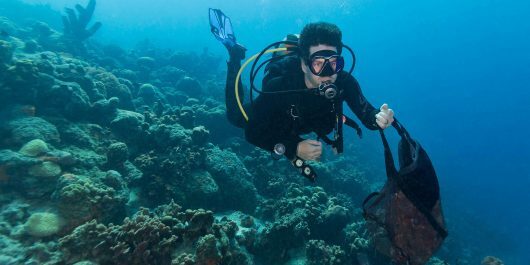 Make sure to plan your diving with a reliable company that places your safety first. Check all your equipment before the boat leaves the harbor to make sure it meets your standards! I love pretending to be an underwater adventurer. 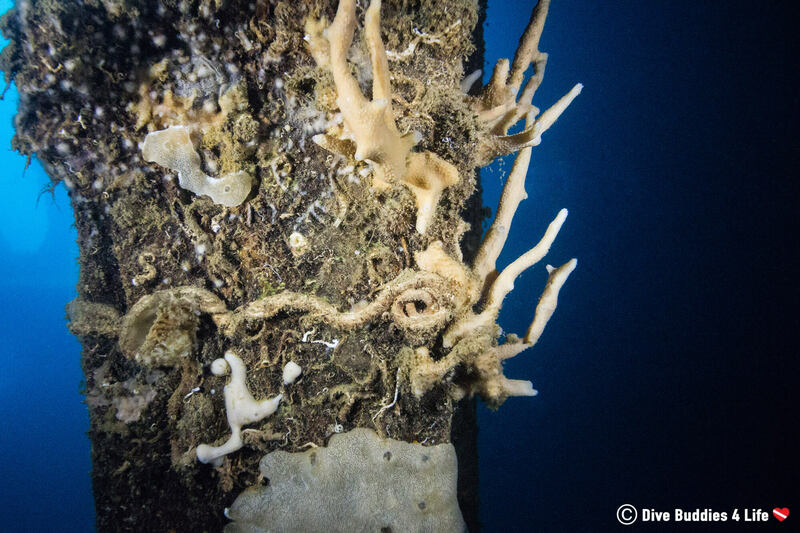 There is so much left to discover hidden on the ocean floor. 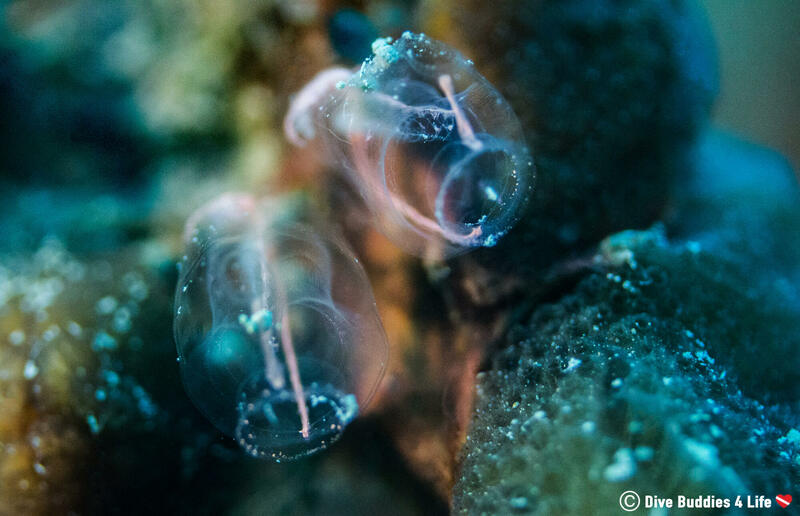 What is the coolest discovery you have seen while scuba diving and what country was it located in?